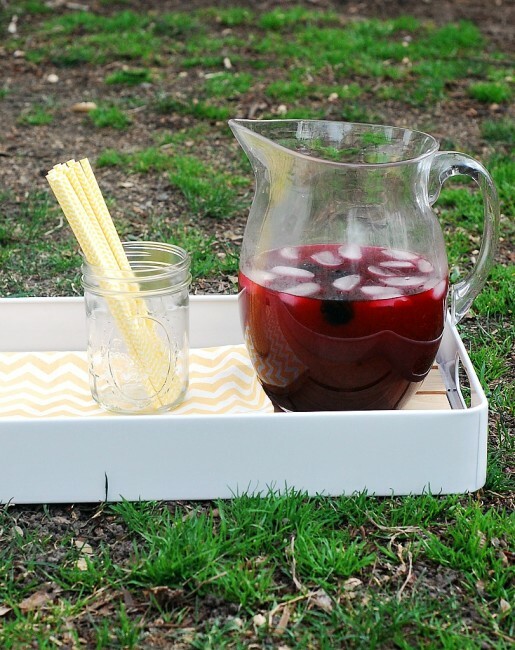 For your next picnic, make a batch of this blackberry lemonade. It’s sweet, and tart, and very refreshing! I’ve found yet another reason to be excited about spring and warmer temperatures: picnic season! Liam and I have already had one “snack picnic.” We packed up some snacks (Goldfish, dried fruit, some cookies, and milk boxes), and walked a few blocks to a local park. We ate our snacks in the sunshine, watching kids playing and dogs walking and people riding bikes. Today’s #SundaySupper is all about picnic foods — the most delicious appetizers, entrees, side dishes, desserts and beverages that are easy to pack up and bring along on a picnic, whether that picnic is for two people, or a crowd. 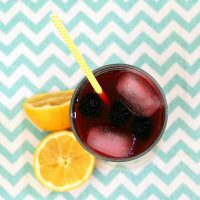 My blackberry lemonade is inspired by a drink I had at a local chain restaurant. I actually had blackberry iced tea, and while it was tasty, I thought the blackberries would pair much better with lemonade than tea. I checked out TheKitchn.com for a tutorial on making lemonade from scratch. The basic ratio is 1 part lemon juice, 1 part sugar, and 5 parts water. That means for every cup of lemon juice and sugar, use 5 cups of water. Instead of making a “plain” simple syrup (which consists of equal parts sugar and water), I flavored the syrup with blackberries. It’s a very easy recipe, and if you start early enough, it can be made in one day. If you plan on having a morning picnic, make the syrup (or the whole lemonade recipe) the night before. One tip: make lemon-flavored ice cubes. Mix equal parts lemon juice and water. Freeze in an ice cube tray, then add the cubes to your lemonade. It will keep your lemonade chilled without diluting the flavor. In a large saucepan, combine the sugar with 2 cups of water. Set over medium heat and stir until sugar dissolves. Bring to a simmer. Add the blackberries, and cover the saucepan. Let simmer for 2 minutes. Remove from the heat and uncover the saucepan. Cool to room temperature. Strain into a storage container, and place in the refrigerator to chill. 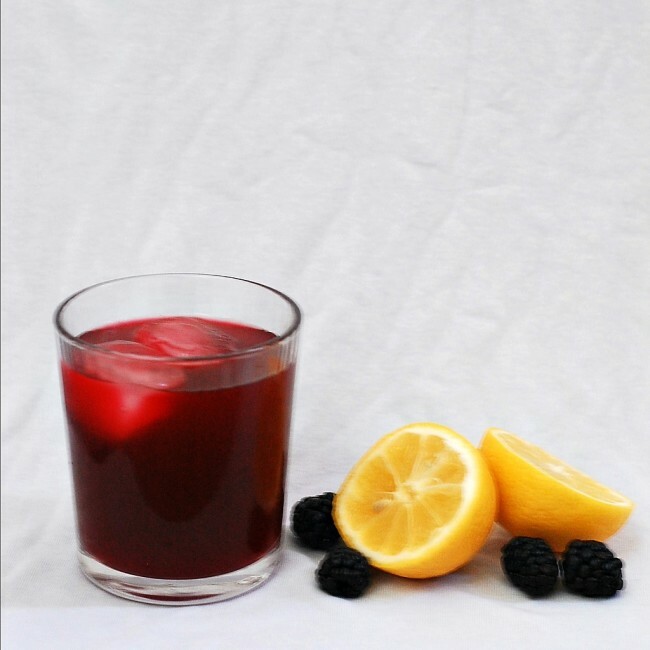 In a serving pitcher, combine the blackberry syrup (straining again, if necessary), the lemon juice, and the remaining water. If serving immediately, add ice cubes. If not, chill until ready to serve. This looks SO refreshing, and I love the idea of lemon ice cubes! What a refreshing addition to any picnic! Love blackberries. My mouth is watering, thinking about how good that would be!! I could drink a gallon of this, I love blackberries! Just gorgeous!!! The color is magnificent! This sounds absolutely fabulous! I have GOT to make it for our next BBQ!! This looks so good and sounds so refreshing. Delicious! I can’t wait until the blackberries are ripe to make this! 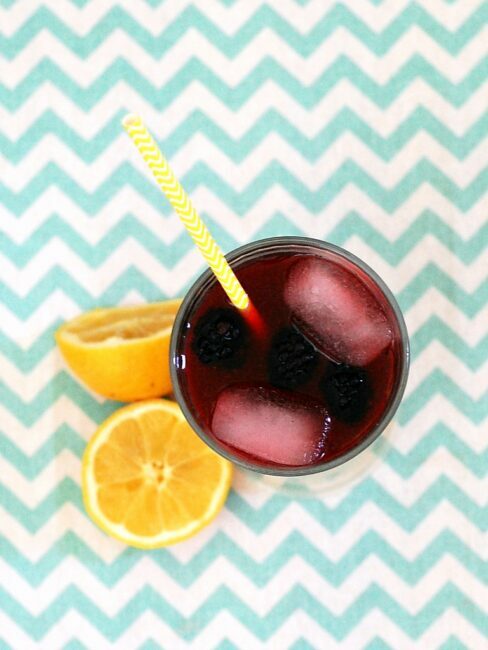 This looks like a perfect summertime beverage! LOVE me some lemonade… and blackberries too? Picnic in a glass! Ah, I’m in for blackberry anything!! Pour me a glass, pretty please. This looks so refreshing and our great minds think alike with the ice cube idea. This looks so refreshing and I love the tip about making lemon ice cubes too! I love lemonade. Making it. Drinking it. Playing with it. Yours is beautiful.